Jammed door latches can prevent the privacy that usable locks do offer people within residential and commercial areas, it also interferes on the security of the properties. It is important to understand the different causes of jammed door latches, for the purposes of preventing them. If you constantly have jammed door latches problems, contact GreenPro Locksmith in Atlanta, for a lasting solution. This is perhaps one of the commonest reasons for jammed door latches. When the metal latch is not falling into the hole inside the strike plate, then there will be friction and eventual stoppage. This issue occurs when the air moisture in the expands the door’s wood, or when there is a shift in the foundation. Shifting the strike plate into a position where the door latch can easily fall into the hole, is a temporary solution to this problem, a much better approach is to prevent moisture from the door’s wooden frame. The buildup of dirt inside the lock of the door can cause latch jamming. Rust is another issue that can create friction especially along the moving part of door latches, and the most efficient way to fix this problem is to disassemble the door lock, and then clean them inside a solution of vinegar (vinegar must have at least 5 % acidity). You can make use of a car wax in resealing those little indentations inside the door metal- such indentations may leave the door metal to further rusting in the future. If your door is constantly facing latch jamming or misalignment of strike plate, contact GreenPro Locksmith for a lasting solution. Jammed door latches might have occurred as a result of the breaking of delicate internal machinery in some locks. You can ascertain this problem when the door latch gets stuck and especially when you are moving the handle. Internal problems mean, there is nothing wrong with the latch bolt, but the mechanisms that are connected to the device. Internal mechanisms that can cause jammed door latches may include the lock’s spindle, the hold of the spindle, or the lock itself. The issue of internal part malfunction can only be resolved by a professional, certified locksmith technician. The technician will diagnose the component or group of components are problematic, before replacing such with better components that will last for a longer time. Sometimes, changing the entire lock of a door will eliminate the need to carry out repairs, hence you need a certified locksmith technician who can provide a better alternative to the locks you presently have on the door. You can rely on GreenPro Locksmith for 100% reliable and guaranteed door lock upgrades. 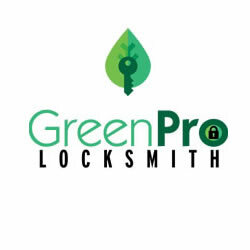 There are several ways you can benefit from the professionalism offered through GreenPro Locksmith technician, the replacement component parts are authentic and standardized, hence they are reliable and more durable than older conventional door locks you are used to. Contact GreenPro Locksmith for your door and lock related issues today and a certified technician will be on hand to help you.